The year 2002 saw Guided by Voices return to their old indie home away from home on Matador Records. After a two LP run with TVT Records, Guided by Voices delivered a 19 song LP less than a full year after their studio polished Isolation Drills LP. As a follow-up, Universal Truths And Cycles is a some-what return to form production wise. To be clear, this LP is not exactly matching the lo-fi glory of Alien Lanes, but more the mid-fi style that was to become the staple of near-future Pollard solo records, courtesy of Todd Tobias. 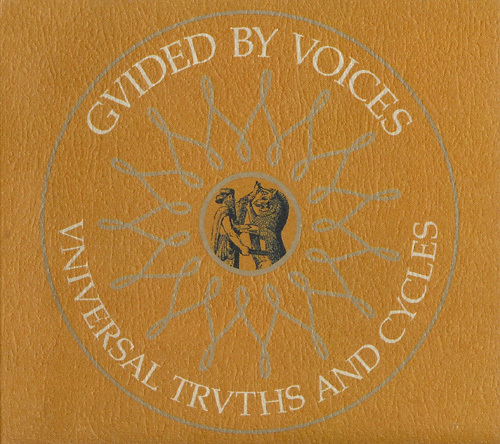 Universal Truths And Cycles also marks a further descent into the proggier, later period of Guided by Voices. The snippet, brit-pop, flash-before-your-eyes pop is mostly gone here. It's wake has left instead more of the early 2000's awkward chord arrangements, minor-chord downers, and prog soaked pieces. All territory that seems to be tied to the presence of GBV guitarist of the time, Doug Gillard. While not a bad record, the LP is one of the weaker spots in the final run to the final GBV LP in 2004... that is of course before their reunion in 2010. Wire Greyhounds- 3 Returning to the blink and you’ll miss it format of the past, this song’s over in just over 30 seconds. Unlike most songs of the prior catalog, it has two parts awkwardly pasted together to make a slightly catchy, but head scratching opener. Skin Parade- 3 Hollow acoustic strums open the track before kicking into a mid-tempo, stomp rocker. Not much at all in the way of overt hooks, but the repetitive guitar riff will surely get stuck in your bobbing head. Zap- 3 Pretty, acoustic number with sparse percussion. Definitely on the softer side, this track falls flat of achieving a memorable melody. Christian Animation Torch Carriers- 4 Guitar and vocal intro goes on for about a minute, before exploding into a stop-start trudging, proggy number. Doubled vocals give it a psychedelic feel, and the finale is pretty great. Solo in the middle is pretty cool as well. Certainly a booming number. Cheyenne- 4 Carefree, big sounding mid-tempo rocker, that’s easily hooky with the plethora of Pollard’s bellowing “Cheyenne!” Ending of the song is much less annoying, and more grandiose than the opening verses. Wins me over by the end more and more every time. The Weeping Bogeyman- 2 A hushed, creepy acoustic number that goes nowhere. Borders on a 1. Back to the Lake- 5 Great Scott Japolin-esque intro that barely amounts to a snippet, and leads into uplifting 4/6 time song, tightly held together by precious guitar chord bursts and steady hi-hats. Best chorus on the album. Simple and effective. Love 1- 2 Short number, that has a guitar line like something out of a 70’s movie cop intro. Song is rather unmemorable and meandering. Storm Vibrations- 2 One of the longer tracks on the LP, begins with meditative Doug Gillard, guitar jangle. Dynamic, but ultimately the result is a plodding, and gloomy meh kind of song. Factory of Raw Essentials- 2 Short acoustic number, with mismatched chords, haphazard monotone vocal melodies. Song title, however, would later become important to the historic. Title is seen on printed on a myriad of subsequent Pollard related material somewhere on the artwork, following the release of this song. Everywhere with Helicopter- 5 One of the singles from the LP delivers a compact, harmless rocker with great fuzz solo written after too many listens to “Taxman.” The lazy, vocal melody is a particularly highlight. A rare song you can both whistle and pump a fist too. Pretty Bombs- 4 Mid-tempo, late ‘90s radio-sounding alt rocker, that eventually spills into a violin drenched movie soundtrack section. Song remains surprisingly hooky throughout. Eureka Signs- 3 Mid-tempo song on the heavier side, expanding on some of the material that started to pop-up and drag out on “Isolation Drills.” Run of the mill in most aspects. Wing of Thorn- 4 Rigid, snare marcher of a tune with Pollard pulling off melodic acrobatics of no true form. Vocals akin to something off an early GBV EP. Neat little track for your back pocket. Car Language- 1 What starts off as a hypnotic two-chord guitar pattern, continues for much of the next 4 and a half minutes, with various, loud and droning changes. I always come back to this track with intrigue, but it offers very little else. Well, it does feature an orchestra of car horns at one point. From a Voice Plantation- 1 Tom rolls and orchestral swells make for another moody piece following the downer of “Car Language.” Sheer curiosity might bring one back, but these two snoozer LP tracks back to back induce NyQuil symptoms. The Ids are Alright- 3 Organ and acoustic number in under a minute that brings to mind a hi-fi version of something off the Fast Japanese Spin Cycle EP. Universal Truths and Cycles- 5 Hey, a title track. Not something GBV’s been a big fan of in their careers! This track is also one of the most interesting, complex melodies and structured songs GBV’s done. The verses teeter on the brink of being awkwardly arranged, but eventually gel into what is a breezy, uplifting, and great vocal melody, and of course great song. Boy, do I agree with you on this one. Universal Truths and Cyles (the track) is one of the genuine deep cut gems of the GBV catalogue. Pretty Bombs and Wing of Thorn are also great. Your 5s are, obviously, indisputable. - Cheyenne is a 5. - The two first tracks are big 4's to me (or straight damned 5). The pair makes one of my favourite GBV album openings. After years of listening I would bump up the first 3 tracks to a 4. "Skin Parade" might be deserving of a near 5. This record seems to be a precursor to all the weirder avenues that he'd run down in the last 15+ years. As GBV on the whole it always felt out of place but I'm beginning to come to terms with those proclaiming this to be a great record.